Because it has blown mine. 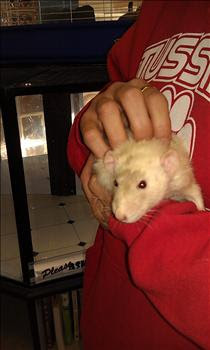 So I was on Petfinder today - getting to know all the current pets up for adoption at Richmond Animal Care and Control (the home of Ham Skillet) - when something peculiar caught my eye: Ratatouille. Hi, there. I'm not a chef, but I sure do like to cuddle with my peeps. Oh! It's a rat (as in rodent)! I thought, feeling a little silly. It's not like I'd never heard of shelters taking in caged small animals (like rats, rabbits and even snakes) before. It's just that I wasn't expecting to see one today. So then, naturally, I had to know why the little guy's owner surrendered, or worse, abandoned him: Did they move? Did their new significant other hate rats? Were they hospitalized? Or dead? "Super friendly fancy rat found loose in the city. " Found loose in the city (as in Richmond CITY, not the burbs, teeming with fast cars and over 200,000 people)?! What the peanut butter fudge?! OMG! What are the odds?! What animal-loving, no-rat-fearing, decent human being scooped him up and had the know-how to get him to a shelter? And what about the fantastic, amazing, caring and unprejudiced people who run Richmond Animal Care and Control? I say Ratatouille is one LUCKY RAT! If I say "cheese," are you gonna give me some this time? And as of yesterday, because no one has come forward to claim him, one lucky rat who's gonna make some lucky person a great little pet. 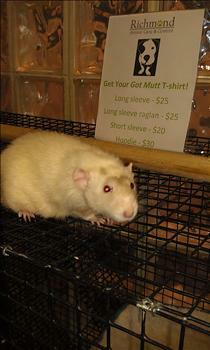 Whether you like rats for pets or not, you've got to admit this is one uplifting example of all the good that can be served by our local animal shelters. It gives me hope. P.S. Although I've never owned a pet rat, one of my husband's college roommates had one, Edwina, who spent most of her waking hours out of her cage, playing and interacting with humans. She was one smart, funny and surprisingly affectionate dude-ette. Supposedly domestic rats are quite social and quite intelligent. It makes me sad to think of the poor guy running around lost, or even worse, dumped. My Human would never have rescued the furry critter. Around the barns they put poison in rat holes and then they died and smelled awful when the weather warmed. Also, she told me about a humongous rat in an alley she needed to cross to get to a parking garage and her car. Nope, if left up to my Human, the poor rat would still be out there. Hawk, your mom is with the majority, I would guess. That's what makes this story (and the little rat) so incredible! Lucky indeed! My mom's friend growing up had a rat she always took everywhere...one time mom got a ride home and the rat nearly scared my mom to death because they would let him loose in the car! Well, I wouldn't like a rat running all over my car, either, Scrappy! My niece had a rat and it was a very sweet pet ;) Very nice story, thanks for sharing!!! Julie, I had to share it! you don't want to know what my humans do to rats. that goodness that one wasn't running around our backyard. I have 2 words for you girlfriend. Incontinence diapers. Not the greatest rat fan, but that IS an amazing story. And he IS kinda (kinda?)) cute. I think. Maybe. What a cool story! Although I think I'd have to draw the line at rodents! Sorry, nope, doesn't come close to cute in my book!! 24 Paws, you need to watch several Disney films featuring mice and rats. Mickey and Minnie, however, don't count - they are strange. I guess I'm in the minority, nothing new about that! I love rats and mice and just about all creatures including snakes, lizards, spiders and bugs. I've had pet rats before. I see the wild ones in the bushes around my horse stalls quite often. What kind of person scoops up a rat off the street? I would! Corgi Lady - I would have scooped him, too (as soon as I finished breathing into a paper bag to stop the hyperventilating - it's just not every day that one meets a tame rat on the street). ;) I love the creatures, too - except for fleas and ticks and lice - I can't find one reason to like them. I'm impressed with the person who recognized this was a fancy pet rat. And so happy they had the wherewithal to do something with that knowledge. Haha! Leslie, if my off-the-blog friends decided to go the more "normal" route, I'd have been friendless a while back. I'm the lady who quit using her back porch because it would disturb the gigantic writing spider who'd made a web in the corner (among other things). It's good to have a diverse group of friends! Wowzers, what a story! Most people I am sure would have just freaked out and ran away, but the fact that someone actually stopped, decided this rat was actually someone's pet, picked him up and brought him to a shelter? That is full of awesome. Kristine, I had three gerbils and I can't even remember their names. Sad. They were a little lacking in personality. Silvie - Nice to see you! So is my husband (a phobic). He screamed at a mouse in our garage. Silly. That poor lost, really disgusting rat...I'm sure he is sweet as heck, but... ***shudder*** Weirdly, I had a gerbil once (named Ratsun) and I loved that tiny little rodent dearly. He was a big fan of fresh fruit and Susan Sarandon movies. I wish i had pictures of that little imp. Secondly, I can't beleive they FOUND that rat, he must be very friendly. I am more of a guinea pig lover myself, but I've heard they make great pets.